Holy Cow! We survived another hot, hot summer and the Holidays are already lurking around the corner. 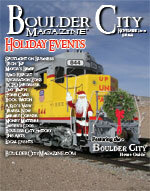 Boulder City has some hidden shopping treasures around town not everyone knows about! Recently the Alan Bible Visitors Center Gift Shop temporarily relocated to National Park Service Headquarters at Nevada Way and Wyoming. Open 7 days a week, they have wonderful “kid” gifts, smooshie stuffed desert animals, and great books. Our Community Hospital houses another hidden shopping treasure, no sick family member or friend required; plenty of parking, and delightful surprises for everyone in the Gift Shoppe, left, just inside the main entrance! Open Monday through Friday. Marshall Plaza is home to Boulder City Florist, another shopping treasure. Chris has sensational seasonal gifts in addition to always fragrant fresh flowers, and be sure to ask about her locals discount. Right next door is BJ’s Lady Bug Nursery with lots of fun, sometimes quirky gift selections, not to mention live plants! A few doors up, Interiors by Diane has unexpected gifts in with the flooring and window coverings! Voting is a privilege  be sure to exercise it! When you are out and about, be kind to yourself and your neighbors, always put those pesky shopping carts in their cart parks! The dent you prevent could be yours! NEAT NEVADA NOTES: Big Sagebrush, also known as Big Sage, is Nevada’s designated State Flower. In March 1917, Big Sage was adopted as the State Emblem. Finally, in 1967, Big Sage was adopted as Nevada’s Official State Flower. The techie name is Artemisia Tridentata which solves why University of Nevada Reno’s yearbook was dubbed The Artemisia oh so long ago! Also listed on the USDA roster of “invasive and noxious weeds”, our State Flower is an evergreen with short trunk, gray-brown bark and 3 lobes on the gray-green leaf tip. On the all too infrequent occasions when it rains, the wonderful damp desert fragrance is attributed to Big Sage. To check out the official “weed” list, visit www.plants.usda.gov. Big Sage is in good company with ferns and silk trees!